Dabba relies on a variety of Open Source software application to enable their network. Here is a profile of some of those applications. Every local connection starts with a wireless access point (AP) that connects phones and computers alike to the Dabba network. These APs rely entirely on a suite of Open Source programs. I should point out that what I am about to describe is the latest in an evolution of strategies for access points for Dabba. In this latest iteration, a clever antenna enclosure made by poynting.co.za harbours a Linksys router. Each Linksys router has had it’s firmware (its internal operating system) replaced with an Open Source alternative called OpenWRT. This software expands the range of control that a user has over the device and offers the potential for installing additional software. A large developer community has developed around initiatives such as OpenWRT and there are many similar initiatives such as DD-WRT, Tomato, and others. Now that the router has a flexible, adaptable Operating System, the next installation is B.A.T.M.A.N. 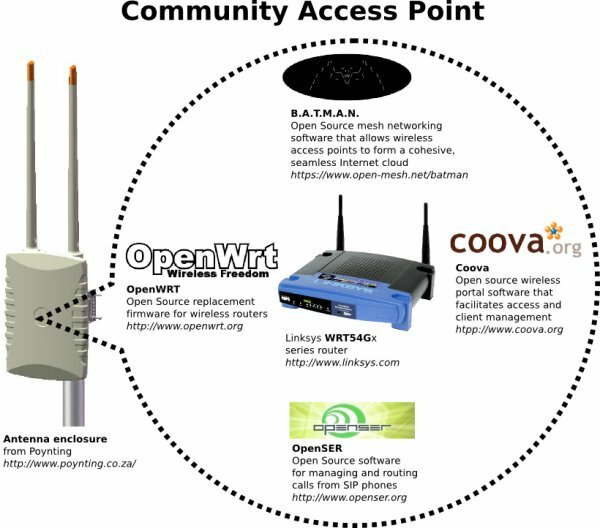 This is a mesh networking algorithm developed by the Freifunk community. B.A.T.M.A.N. which stands for “Better Approach to Mobile Ad-Hoc Networking” is an improvement on the OLSR protocol developed by the same community. It allows wireless nodes to seamlessly and automatically configure and re-configure themselves into a cohesive network. This is transparent to the user connected to the network. Meshing offers the potential to dynamically deploy wireless networking by simply and transparently adding nodes to a wireless network. Next there is OpenSER (Open SIP Express Router) is a high-performance, configurable, Open Source, SIP ( RFC3261 ) server which can connect, authenticate, and route calls from SIP phones. It has the advantage of having a very small footprint and being quite efficient which makes it ideal for use on Linksys routers. It also means that each wireless node can route local calls directly from phone to phone without needing to refer them to a central server. Finally, there is Coova. Coova makes captive portal software which allows each wireless access point to authenticate data users i.e. people who connect to the network with a laptop or smartphone browser. The portal ensures that users authenticate via pay-as-you-go data cards. SIP phones are passed through directly and authenticated via a separate system. More about that later. One of the challenges of automating and simplifying the function of these wireless nodes is to have voice and data systems authenticate against a common database of users so that clients can have both voice and data credit in a single account. It is remarkable to think that all of these Open Source applications can reside on a single inexpensive wireless router like the Linksys WRT54GL or GS. You can see here at the left Rael is demonstrating how the antenna with embedded router can be connected to a small solar panel to create a completely self-sustaining wireless access node. In a future post I’ll talk more aobut the software that runs on the back end of Dabba’s systems.